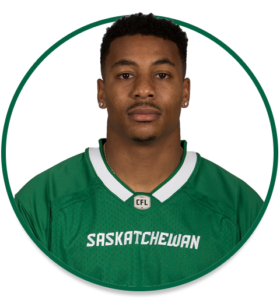 PRO: Signed with the Riders in April, 2018…attended mini-camp with the NFL’s San Francisco 49ers in 2017. 2018: Played 18 regular-season games, starting one, at defensive end…registered 17 defensive tackles, 17 special-teams tackles, three quarterback sacks, three tackles for loss and one forced fumble…played the Western Semi-Final…registered two defensive tackles. COLLEGE: Spent five seasons at Gardner-Webb University (2012-16)…had 203 solo tackles, 142 assists, 35.5 tackles for losses, 10.5 sacks, five forced fumbles, three interceptions and two fumble recoveries in 47 collegiate games…was named an All-Big South Conference performer three times in his career…was selected as an FCS All-American after the 2016 season.